Why Juno Therapeutics and Barracuda Networks made headlines as indexes soared on Friday. 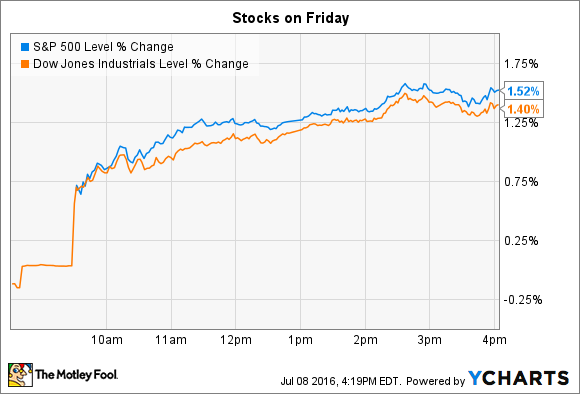 Stocks rallied broadly on Friday as investors digested improving data on the U.S. job market. The Dow Jones Industrial Average (DJINDICES:^DJI) added 250 points, or 1.4%, to surge past 18,000. The S&P 500 (SNPINDEX:^GSPC) gained 32 points, or 1.5%, to finish just below its all-time high set back in May of last year. Job growth rebounded to a 287,000 monthly pace in June, according to official statistics released Friday morning, marking a sharp uptick from the prior month's 11,000 and surprising economists who had forecast 170,000 new jobs. The average over the past three months, which smooths out some of the metric's volatility, was 147,000. While average growth on the order of 200,000 jobs or more would be consistent with a fast-growing economy, the current figure isn't low enough to point to another recession, either. Other data in the report also indicated that the job market remains healthy even as it grows slowly. For example, hourly wages rose by a strong 2.6% in the last year. Meanwhile, stocks making notable moves on Friday included Juno Therapeutics (NASDAQ:JUNO) and Barracuda Networks (NYSE:CUDA). Biotech company Juno Therapeutics lost 30% of its value after the U.S. Food and Drug Administration put one of its key cancer treatment clinical trials on hold. Phase 2 testing for the JCAR015 drug was suspended following the death of two patients last week, the company announced in a press release. JCAR015 has been one of Juno's most promising treatments. Early data showed that it achieved complete remission in over 80% of patients with acute lymphoblastic leukemia and executives were optimistic that it might quickly find regulatory approval and make it into production by early 2017. Juno listed JCAR015 as one of its three most advanced product categories aimed at combating the 45,000 annual deaths in the United States from lymphoma and leukemia. This week's move by the FDA threatens that production timeline. Juno executives believe they've traced the danger to a chemical that was recently added to the treatment and are petitioning the FDA to allow the trial to quickly resume. However, there's no telling when, or even if, regulators will agree to put JCAR015 back into advanced patient testing. Network security specialist Barracuda Networks rose 18% after posting surprisingly strong quarterly results, putting shareholders close to positive territory in 2016 but still down by over 50% in the last full year. Barracuda beat consensus estimates on both the top and bottom lines as revenue rose by 11% and earnings doubled, year over year. Operating profit improved to $5 million from a $1 million loss last year. The software company also managed to produce $3 million of net income, compared to $4 million of red ink in the prior-year period. "We delivered strong results in the quarter and exceeded guidance on revenue, billings and earnings per share," CEO BJ Jenkins said in a press release. The company also issued an aggressive forecast for the current quarter and the full year that outpaced Wall Street targets. Executives see improving billings helping push revenue up by 7% to $343 million. Earnings will be roughly $0.57 per share, well above consensus estimates calling for $0.47 per share.